Starting with the PowerMac G3, Apple began removing the old serial port/GeoPort connectors on their product lines, and replacing them with USB. This was fine if you’d purchased some newer hardware that supported USB, or Firewire. However, if you wanted to use some older device that used the serial port, you were fresh out of luck. However, most Apple hardware (until the PowerMac G5), secretly did support the serial port! It was just tucked away on an internal connector! 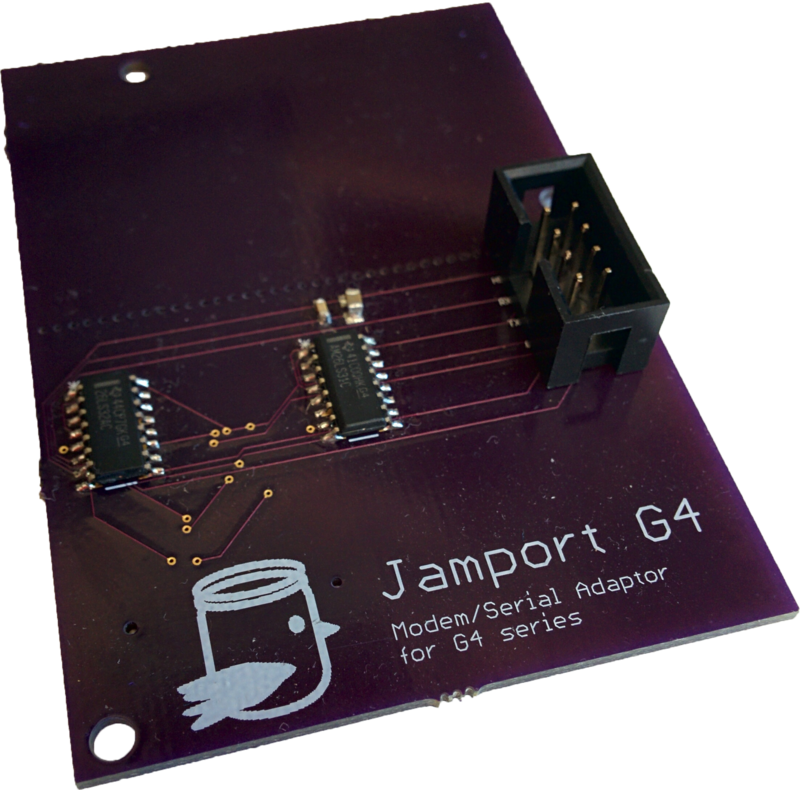 Jamport allows you to use this hidden serial port on your Mac, as long as you’re willing to replace the modem card with it. However, these are no longer manufactured, and the eBay availability (and prices!) are sometimes a bit ridiculous. 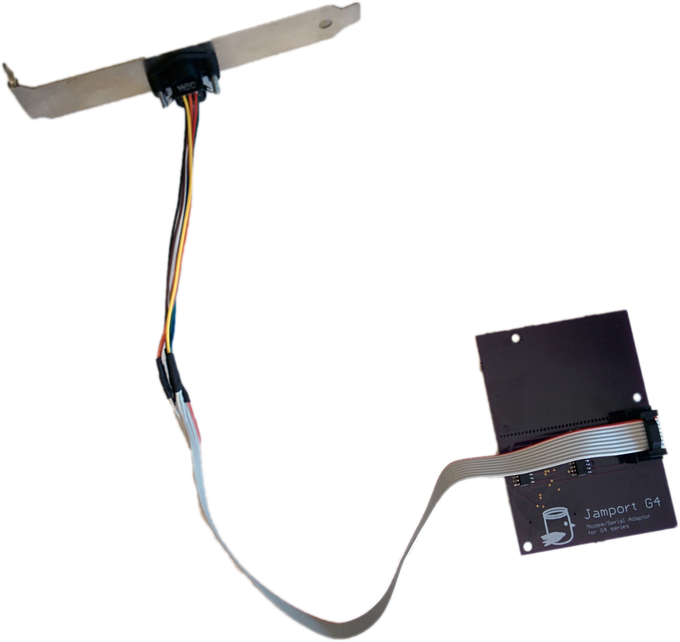 They too, like this device, access the serial port by otherwise unmarked lines on the modem port. The PowerMac G4 Cube will probably work; just ensure it has a similar looking 40-pin connector, as shown in the above photo. The Powerbook G4 may also work, but isn’t very straightforward. See the Powerbook G4 page for details. Currently unsupported, since they have a different internal connector. 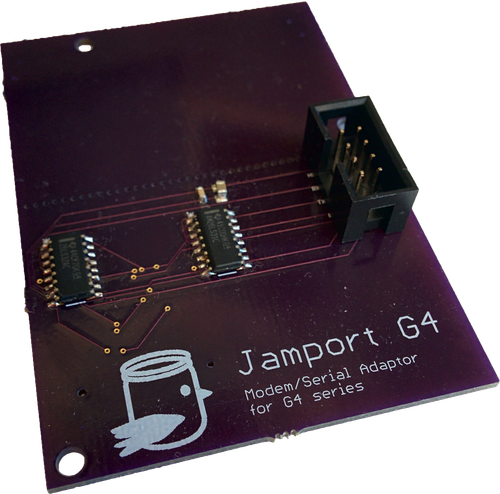 I’m working on a compatible version of Jamport for these devices too, though. At this point, I am not sure what the connector looks like, nor its pinout. If you have more details, such as a high resolution photo of the logic board, or know the pinout of the debug connector, please contact me. I’ve currently got none in stock, with a couple on back-order within the next week or two. Feel free to email me if you’d like an email when they’re back in stock! The purchase buttons above may not appear if you’ve enabled certain filter lists in your ad blocker. If you have any questions about payment or shipping, don’t hesitate to email me. Please see the development page for technical information on AppleTalk, pinouts and implementation.